It's the end of the 19th century and 16 year old Jay Cavendish (Kodi Smit-McPhee) is in love. However, the object of his affection, Rose (Caren Pistorius), is on the run - following an accident that Jay believes is all his fault. Jay journeys across the American frontier to find his lost love - unaware that he is being pursued by a band of dangerous outlaws. He is soon joined by Silas (Michael Fassbender) - a man who is part protector, part guide and, potentially, part something sinister. So soon after watching The Revenant, I felt a little reluctant to watch another film about a group of frontiersmen. 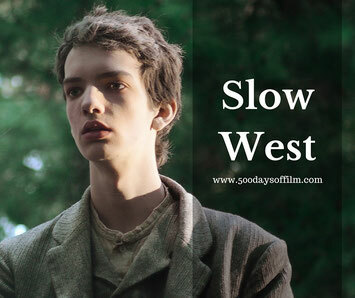 However, I have been meaning to watch Slow West for months and so I decided to put all my reservations aside. And I am really glad that I did. This is a funny and sweet love story wrapped in a tense and engaging western. I was enchanted by Smit-McPhee’s performance as Jay. He is just so innocent and good. Jay is the perfect partner for the world weary Silas and Michael Fassbender is (as ever) instantly engaging and charismatic in this role. Slow West tells a small, almost fable-like, story and has an unreal visual quality to match. The movie’s colours and location shots are vivid and look almost like paintings - every scene is gorgeous. Meanwhile, events are accompanied by whimsical music - hardly the soundtrack to a brutal and dangerous environment. Yet, despite the stylish beauty of this film, there is also tension and violence. We never quite know the true motivation of any of the characters we meet. Jay is a jack rabbit in a den of wolves. I cared and truly feared him. When the focus leaves his innocent perspective, we see evidence of a brutal reality. Nothing is what Jay thinks it is - or what he desperately wants it to be. A thoroughly enjoyable film, I loved Slow West. Michael Fassbender was executive producer on Slow West. Slow West was actually filmed in the South Island of New Zealand. Have you seen Slow West? If you have, what did you think about this film?